If it makes a difference in not looking for the preset controls. On/Off, Color, White Temp and Dimming are all I need. Not gonna drop it at all These devices are great, and this is a good puzzle to solve. Perhaps the very first version or second version in the history of the GIT might work... I’m not sure, though. I've been testing a new version of the drivers here for a couple days. Looks like the new connection method I'd written was causing the slow down. I've reverted the method to the original, for now, and I will continue to debug the new version while possible. Expect connections to take longer with this new version. I'll keep chiseling away at it when possible. I installed it in my development hub, it works, on and off, hue and saturation, white level must be clicked twice to make it work. How’s the speed of your hub? Any lockups with this version? Speed is fine, I just tested both rgbw strips and they worked. Thank you. Lights turned on with a rule for the first time in a week or so after updating the driver. Hub seems faster but it could be psychosomatic. I have the same functionality issues but nothing has been lost. Overall net gain of a faster hub and it started responding again. I was so busy for the holidays I didn't fight the failures and just turned the lights on with the MagicHome app. 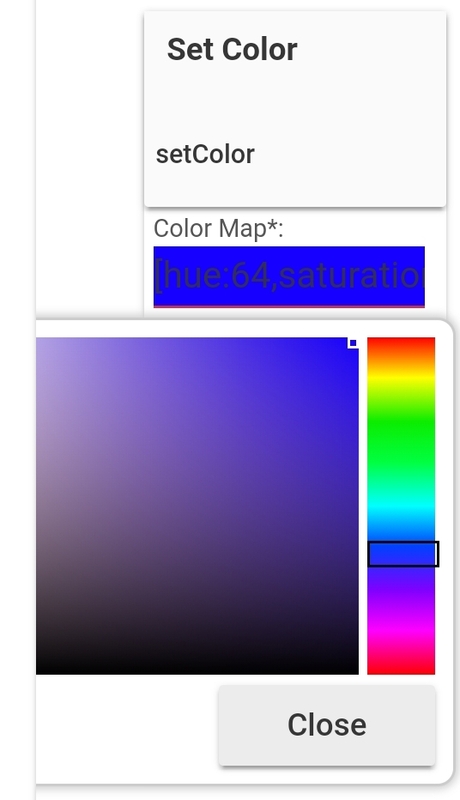 An update, I installed the driver on my production hub, has been a full week working, the only detail is the set color button, but everything else works, even with google HE integration can change the color correctly. Thanks. Hello Folks. Very much noob needs a little help with this controller. I purchased the NexLux strip lights with the controller your previously mentioned. Using the Magic Home app, the lights work great. I downloaded your Beta device driver (no problems there). From the Magic Home app, I can see the IP address which I entered in the driver under Preferences: Server Device IP (I entered the full address: 10.189.1.107). Device Port is 5577. Under Device Information: Device Name* - NexLux, Device Network ID* - DC4F22C2376A, Status* - INACTIVE, Type* - MagicHome WiFi - Controller (RGB). When I try to activate lights On/Off using device driver commands, nothing happens. Can someone tell me what I'm doing wrong or point me in the right direction? Firmware version on the NexLux controller is 33.v4-17.6445-A Thanks!!! Hmm. Those lights SHOULD work—at least, with power on/off. Let’s check a few things, since I’m still working on the RGB variety (it’s in my box of devices to fully add). Are the logs saying anything when you try and issue commands? Thanks for the quick response, much appreciated. This is going to one of those baffling incidents!! I loaded devices drivers MagicHome - Bulb (RGBW), MH - Controller (RGB), and MH - Controller (RGBW). I'm using MH - Controller (RGB) according to the Type* parameter. The IP address came straight out of the MagicHome Pro app. When I use my iPhone Wi-Fi Signal Strength app, it indicates 10.189.1.107 as connected to the Wi-Fi network. Logs show entries every time I hit the on and off buttons on the device page in HE. Strange!! I can delete the Controller (RGBW) and Bulb (RGBW) drivers if that helps; really don't need them at this point. That’s the one I found. It looks like the devices are talking—I’ll have to check out the protocol. I appreciate all the info! It helps a lot. Hello Adam Don't put a lot of effort into this until I do some more analysis of my test environment and network. I need to find out why some devices are all of a sudden un-reachable. Apparently several others are using this driver with no problems. Let me look at the time-out problem from my end. Good morning Adam...….problem solved and lights turn on/off. Problem turned out to be too many local networks that weren't talking to one another. Re-arranged HE hub and NexLux on the network and now connecting as they should. Thanks for bearing with me as I learn more about these devices.